Here are links to some items that do not fit nicely elsewhere on the site. There also may be links to them from other pages where you might not think to look for them. Regional/City Series. An extensive section about postseason series sanctioned by organized baseball played from 1905-42, mostly in Chicago. There are boxscores for all 190 of the games in the 32 series, and the vast majority have play-by-play accounts, some deduced. Over 20 years of research by Mike Cantor is the basis of this section about an overlooked part of baseball's history. Also, there are descriptions of other series dating back to 1882 in article by the late Fred Ivor-Campbell. Honoring Jackie Robinson in the year of the 60th anniversary of his major league debut. We show an incredible amount of data about his playing performance. History of nicknames of current teams. We have made a data file with the history of the current franchises: where they play, their leagues and divisions, and their most common nicknames. Game details of the first Major League game ever played! Brief Retrosheet scoring system history and example scoresheet. 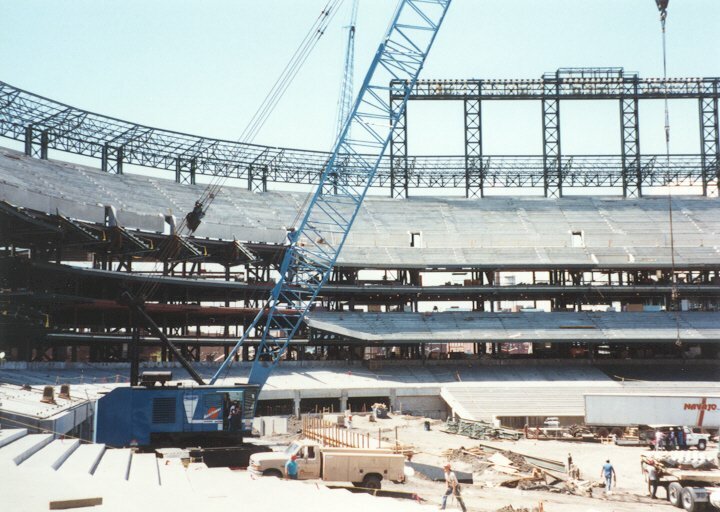 Great picture of Coors Field being built. We have used it for "under construction" pages. Strange and Unusual. [Last updated: Jan. 2002; since we no longer publish a newsletter, this list may be updated very infrequently if at all] There is no end to the unbelievable plays that can happen in a game or during a season. As we process scoresheets, we run across many of them. How about a strikeout with the batter being out 767? It actually happened, and you can read about it here. These plays are compiled from newsletter starting with Vol. 3, No. 3. The earlier newsletters also have some incredible plays, and orginally we called them Odd and Cute. Choose the News link to visit the page with the newsletters if you want to browse them.